This issue's article is written by Shri L. N. Jhunjhunwala on a meeting between the famous scientist Shri Satyen Bose and Jagat Guru Shri Shankracharya (who reconstructed Vedic Mathematics). It was originally published in the July 2003 issue of South Asia Politics magazine. Indira Gandhi National Open University (IGNOU), where I happen to be a member on the Board of Management, has entrusted me the job of making a film on India's first Noble laureate and the great Scientist, Shri c. v. Raman. I was doing my studies for the same. When I saw the reference of Bose Einstein theory I was lost in the trip down memory lane of my Calcutta University postgraduate education days. Shri Satyen Bose was the top most Indian Scientist of his time. I was fortunate to be his student in the postgraduate classes of mathematics. If my memory is not failing me, we were hardly four students. Shri Satyen Bose looked like an Indian Rishi in his white Dhoti-Kurta, snow-white hair and beautiful fair complexion, round face and a strong body. It was 1947 and India had just become independent. I was trying to ride two boats. Astronomy was my hobby and mathematics was helpful in that. I stood first in Mathematics graduation exam of Calcutta University and was a Gold medallist also. Obviously, I was keen to pursue my studies. It was 1956, two years after the establishment of Sansad. The Puri Shankracharya Jagat Guru Swami, Shri Bharti Krishan Tirthji Maharaj (1884-1960) happened to visit Calcutta. I had heard that he was a great mathematician. I went to offer my pranaams to him. When I told him that I was also a student of mathematics under the famous Scientist, Shri Sat yen Bose, he took keen interest in me. He acquainted me with ancient Indian science of mathematics, which was much more developed than western mathematics, which is only a few hundred years old. He recited a number of Sanskrit hymns on mathematics. A number of large multiplications and divisions were done by him within a few minutes. I was stunned. I posed some questions on differential and integral calculus also and he answered the same in no time. I got extremely excited and on the next day went to meet Shri Sat yen Bose. I was meeting the Professor after many years. I told him all, about the Jagat Guru. His first reaction was that I am superstitious and have been swayed by a saffron saint. But when I explained to him Jagat Guru's exploits, he gave me a patient hearing. Ultimately, I was able to persuade him to attend a programme being organised by the Sansad where he and Jagat Guru Shankracharya would share a platform and both would give a lecture on mathematics. I and my other colleagues worked very hard to make this event a success. The notice was sent to various schools and colleges. I and Sh. Dhandharia met some principals personally so that we can ensure the participation of a respectable and knowledgeable audience. The Sansad hall whose capacity was for 200 people was full to its capacity. We placed a huge blackboard on the stage. I introduced Jagat Guru Shri Shankracharya and Shri Sat yen Bose and requested Jagat Guru to open the Conference. He invited people from the audience to write down complicated mathematics questions on the blackboard. Somebody from the audience wrote a long multiplication with about 8 -9 digits. Swamiji wrote the answer within a minute. A number of other people from the audience also wrote various questions, long divisions etc., and Jagat Guru was able to solve them in no time. It looked as if the whole thing was a magic. The programme created a lot of excitement. Shri Sat yen Bose expressed great satisfaction that I insisted and brought him here. After the programme was over, I delved deeper into the subject. The Vedic Rishis got this knowledge by intuition. Swami Vivekananda used to see his Ishtha Mantra shining with a golden hue. Our Rishis were therefore called "Mantra- drishta" and that was their method of acquiring knowledge. Jagat Guru Bharti Krishanji had worked very hard for eight years to get all this knowledge. The ancient Indian knowledge comprises of four Vedas -Rig Veda, Saam Veda, Yajur Veda and Atharv Veda. Each Veda has four Upvedas and sixteen Vedangs. Sthapatya Veda is the Upveda of Atharv Veda. The science of mathematics comes under that. Jagat Guru obtained this knowledge from this Sthapatya Veda. Large mathematical questions can be answered in no time. But it does need some practice. jagat Guru illustrated us by giving examples of eight digit multiplications. But I am giving here illustration of simple multiplications so that the reader can understand easily. This is explained by a Sanskrit hymn "Urdhva Tiryagbhyam (vertically-crosswise)". 2) Thereafter both the right digits are multiplied, i.e. 2 x 3 = 6. This is the right digit of the answer. 3) For third digit, we have to multiply crosswise namely 1 x3 = 3 and 1 x2 = 2. Thereafter we make a total of the two -three & two i.e. five. This becomes the middle digit of the answer. The Shloka explains the multiplication quite clearly - Urdhva means vertical and Tiryag means crosswise: accordingly we multiply vertically and crosswise. Where there are more digits, the multiplication becomes slightly complicated and one has to do certain practice but the answer comes quickly. I am giving one instance of a multiplication of 6471 x 6212. The fifth step consists of crosswise multiplication of 2nd & 4th digit followed by vertical multiplication of the 3rd digit. These seven are added for the final answer: 40197852. The meeting ended with great excitement. It was an interaction between a great scientist and a great saint. Both were the highest men of their times. Three years later in 1956, Jagat Guru went to America and left first volume of the book for publication. His plan was to write 16 volumes but unfortunately his health deteriorated and he passed away in 1960. We are deprived of the huge knowledge, which would have been contained in the next 15 volumes. 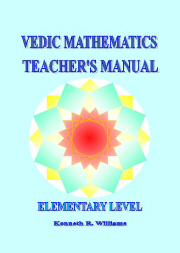 The Banaras Hindu University took interest in it and with the help of Sh Arvind Mafatlal's donation, this book was published in 1965 under the heading "Vedic Mathematics". 16 hymns are contained in the book and they have been explained in great details. Those who are interested should read this book. Sri Bharati Krsna Tirthaji who reconstructed the system we know as Vedic Mathematics was a Shankaracarya of India. 'Shankaracarya' refers to the head of maths (monasteries) in India. There are four of these maths and they were initially established by Adi Shankaracarya who lived in the 8th century AD (some say 5th century BC). Sri Bharati Krsna was Shankaracarya of the Puri math. 1) A Westerner stole the 16 missing volumes and took them abroad where he wrote books of his own (including a book on computers) based on them. This person was approached by Dr Tiwari, a disciple of BKT, and admitted stealing the books. 2) The VM Sutras are not in the Vedic texts, but you can find references to the Sutras throughout the Vedas. These books are in Hindi but Shankaracharya hopes with help to get them translated into English. 4) Shankaracharya says that numbers should be counted from 0, not from 1. 5) Children in India cannot use VM, because they have been trained in the western style. Knowledge of the Vedas and tantras is needed. 7) Shankaracharya can reconstruct the 16 missing volumes if he has help. I have been receiving your E-mails regularly, with lot of interesting news on & about VM. Thank you for the same. As a practicing VM scholar, for nearly 20 years, I have been discovering new insights in the realm of VM (Swamiji's as well the Vedic literature) and Ancient Indian Mathematics. I will be bringing out books & CDs on the same, which include Computer based numerical methods based on VM and AIM. Incidentally, the responses to VM & AIM are steadily growing in Karnataka. Recently, I conducted workshops for the college students and teachers, an advanced level workshop (2 days) wherein 250 students and 45 teachers participated, in Shivamogga, Mysore and Bangalore. Further workshops are on the anvil. I would be pleased to render my co-operation and services for the propagation of VM/AIM, so that a healthy respect is developed for these wonderful contributions by the Ancient Indian Seers & Scientists. I made a Vedic Maths group on YouTube. People can subscribe to the group for free and when new videos come out, they get a message in their inbox. Anyone can watch the videos, but only members can post new videos. Magic methods of maths will remove fear and instill confidence in maths. This workshop helps to calculate fast and accurate. Mental calculation will become 10 to 15 times faster. Huge sums can be solved in one line in seconds. Moreover one can check the answer to reduce the silly mistake and score well. The workshop will definitely be helpful in talent exams like ipm, olympiad, scholarship, competitive exams CAT, CET, GMAT and objective type of exams where speed, accuracy and correct answer play a great role. Special batches for regular and vacation. Age limit: For school and college students only. For details contact-Namrata Chandruva (B.Sc. (stats), B.Ed.) 9819852439. Please note change of details of the UK Academy of Vedic Mathematics. Address: 1 Salutation House, Carsphairn, Castle Douglas, DG7 3TQ, U.K.
Tel/Fax. +44 1644 460 516.